In our basketball news story on 25 January 2010 we asked the question Will Tarbes replace Charde Houston? The answer is that Malian international Hamchétou Maïga-Ba (right) has signed a contract with Tarbes until the end of the season. 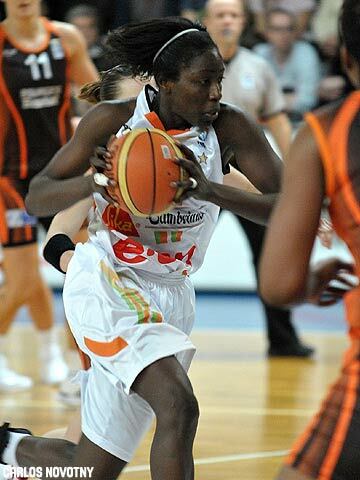 Maïga-Ba has played in the Ligue Féminine de Basketball before. During the season 2005-2006 she played for the now defunct Cavigal Nice Olympique and in 2006-2007 she moved to Mondeville. She played in the EuroLeague Women 2008 final four with Gambrinus Sika Brno and finished second to Spartak Moscow Region. Maïga-Ba went to college in the USA and was drafted into the WNBA in 2002 as the 12th pick. In 2009 she played with the Sacramento Monarchs and is a currently a free agent. Internationally she led Mali to the AfroBasket Championship in 2007. She was the captain of her national team at the Olympic games in 2008 and during the AfroBasket 2009. François Gomis explained that the club was looking for a player that would not need long to adapt and integrate within the team structure. Maïga-Ba played along side Pauline Jannault during her time at Mondeville.